Artisans in Haiti craft these sweet, wall-mounted tea light sconces from recycled oil drums. The little corners of your house—guest bathroom, foyer—want in on the decoration love fest. Give them a touch of warmth with these tea light sconces. They have a pretty amazing story: Makers in Haiti handcraft them from the metal of old oil drums. 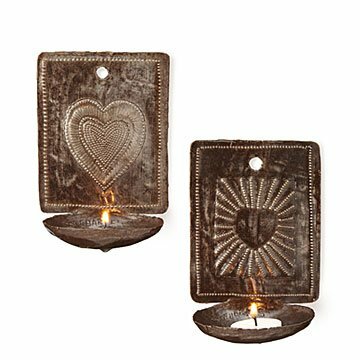 They then create sweet "etched" hearts that reflect the flicker of the candle. Sentimental and a little bit romantic, they're a unique gift for anyone who lights up your heart. Handmade in Haiti. Louis Juste Omiscar began working in metal sculpture at eight years old, flattening and sanding used oil barrels. He began cutting metal when he was fourteen, and apprenticed with the renowned artist Serge Jolimeau, whose metal art has been collected by museums internationally. From Jolimeau, Omiscar learned to do fine cutting and detailing and create his own designs. Now, he has a wife and two children, and works with eight apprentice artists of his own in his workshop in the Village Artistique de Noailles, a three-street enclave of metal artists in Croix des Bouquets, Haiti. He specializes in intricate floral patterns,. “When my art goes out, it lives in the world for me," he says. The finish on your metal wall sculpture is ready for indoor display. For outdoor use, spray the pieces with a clear gloss spray varnish to keep it protected. Untreated, your piece may patina. Romantic ambiance for our anniversary! Easy to hang and easy to clean.